I am honored to have been asked to comment on a book by Carmelo Mesa-Lago, a person I admire greatly for his tremendous contributions to the literature on social security in Latin America and on the Cuban economy. His work has always been scholarly and unbiased, and this latest endeavor is not an exception. I believe this book will become a standard reference for those interested in economic development in Latin America and in the methodology for comparative economic analysis. I was asked to comment exclusively on “Part IV-Costa Rica: the Mixed Model.” Before doing that, however, I will make a brief comment on the relative performance of the three countries, a topic that Roger Betancourt has been asked to comment on. As I agree with all the facts on Costa Rica presented in Part IV, I will limit my comments in the rest of this paper to an expansion and interpretation of two areas that are quite characteristic of Costa Rica and where I believe there are some lessons for Cuba. These two areas are foreign debt management and rent seeking by what Mancur Olson called “distributive coalitions.” Following the ASCE tradition, I will also draw some lessons from Costa Rica for a free and democratic Cuba. The book contains thousands of interesting statistics, and great efforts have been made to ensure, whenever possible, consistency and accuracy. I will discuss only one, the infant mortality rate (infant deaths under age one per 1000 live births), as many argue this statistic is a good proxy for social welfare. The data are presented in the table below. If we believe that the data are reasonably accurate, it is remarkable to note that in 1960 the infant mortality rate in Cuba was less than half of the rate in Costa Rica and less than a third of the rate in Chile. 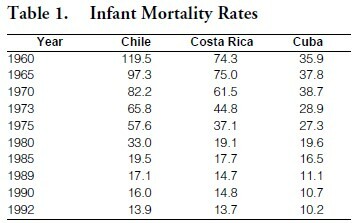 During the period examined, both Costa Rica and Chile were able to reduce infant mortality sharply, to the point that it is very close to Cuba’s. Chile’s performance is particularly remarkable and has been studied thoroughly by Tarsicio Castañeda who concludes that it was due largely to the targeting of interventions on more cost-effective programs and better targeting on the poor. We can conclude that both Costa Rica and Chile were able to achieve very significant improvements in well being without having to suffer the devastating effects of socialism. Since the late 1890s, Costa Rica has been able to borrow large amounts in international capital markets. Alberto di Mare once said that Costa Rica achieved the dream of the ancients—socialism and somebody else paid for it. According to di Mare, once President Figueres was asked how Costa Rica had been able to do so well and he responded: “by borrowing.” Costa Rica has also been able to reschedule its foreign debts under very favorable circumstances. For example, in 1990, I had the lead role in a program where the U.S. Government contributed a grant of more than US$100 million to a “buy-back” of Costa Rica’s international debt. This debt was purchased at about US$0.13 per dollar. In contrast, as discussed by Professor Arnold Harberger during his keynote speech, Chile used its own resources to “buy-back” its own debt at a price that began at US$0.60 per dollar, and which it increased as creditworthiness was enhanced. Obviously, Costa Rica got a much better deal than Chile. Mancur Olson in The Logic of Collective Action (his Ph.D. thesis at Harvard) and in the Rise and Decline of Nations discusses the concept of distributive coalitions. These coalitions are groups that work together to extract rents from the entire society (Anne Krueger coined the “term rent seeking” for this type of activity). If small groups are able to extract rents from the rest of society, they can be very difficult to stop. Suppose that a group of ten could join to extract one dollar from every U.S. citizen. It would be difficult to generate enough interest from society at large to eliminate the privilege that generates those rents. Mancur Olson speculated that in stable societies— those without major political upheavals— distributive coalitions tend to multiply steadily. These groups contribute to economic inefficiency, as discussed, among others, by Kruger and Bhagwati. According to Olson, upheavals often destroy distributive coalitions so that a country emerges from a conflict with a potential for greater efficiency and higher rates of economic growth. To prove this thesis, among other things, he compared growth in countries that were devastated by WWII with those that were not, as well the North of the U.S. with the South after the U.S. Civil War. Thomas Jefferson also speculated along the same line and said that periodic upheavals could be a source of strength for a country. It seems that Costa Rica, which has enjoyed around five decades of relative social and political peace, has provided fertile ground for the proliferation of distributive coalitions. These include the beneficiaries of the myriad of fiscal exoneraciones (the number was reduced during the administration of President Calderón) as well as groups such as teachers (with their early retirement schemes) and taxi drivers (with their medallions). All this rent seeking activity should have a negative effect on economic growth, as real resources are spent for rent seeking rather than for productive activities. 1. Cuba should not worry too much about repaying its foreign debt. If it did, economic growth could be retarded for years if not decades. Costa Rica has been able to conclude, over the years, negotiations that resulted in steep debt reductions, and this has not had a negative effect on its ability to attract foreign investment.3 Hopefully, a free Cuba will be able to attract advisors with experience in economic reforms and other areas. “Tico” advisors on how to negotiate with foreign creditors should be particularly welcome. 2. Rent seeking is a nefarious and unproductive activity, and often leads to corruption. The main rent seekers in Cuba are those associated with the armed forces, and they seem mostly involved in tourism and other export activities. What would happen to these individuals in a free Cuba is not known now. Regardless of what happens to them, it would seem that Cuba can benefit from the absence of other distributive coalitions, and that every effort should be made not to permit new ones to arise. Therefore, it would seem that Cuba should avoid introducing policies that permit differential rates of tariff protection and should strive for very low and uniform tariffs, it should avoid tinkering with the tax system to benefit specific groups and should base its tax system on neutral taxes such as the value added tax. In every area of economic policy, Cuba should strive for neutrality and should not grant privileges to special groups. Cuba should not throw away one of its few advantages after so many years of suffering, i.e., the absence of extensive distributive coalitions. 3. Tolerance for the ideas of others is, in my opinion one of the great virtues of Costa Ricans. While we occasionally see some emotional outbursts in ASCE meetings, I find that in general discussions are civil and courteous. Hopefully, this type of discourse could also be achieved in a free Cuba. 1. The views expressed here are those of the author and do not necessarily reflect those of the Inter-American Development Bank (IDB) or its member states. 2. If asked where I would prefer to live now, I would have to say Chile. I say that because I value free markets greatly, and today there is more economic freedom in Chile than in Costa Rica. 3. Costa Rica attracted, in the mid-1990s, an Intel “fabrication facility” (“fab”). It did so in competition against, among others, Mexico and Chile. Costa Rica was attractive to Intel because it had social and political peace, well trained technical personnel, and enough commercial daily flights to transport out the chips. Its record of not paying its foreign debt in full did not deter Intel from investing.